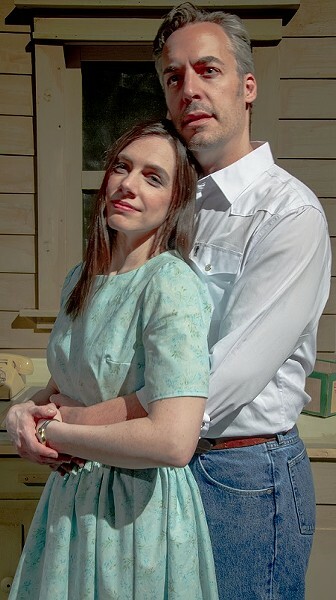 PHOTO BY STEVEN LEVINSON Kristin Mellema and Mark Bradley Miller in "The Bridges of Madison County, the Musical." "The Bridges of Madison County, the Musical"
Following an inspirational research trip through Iowa, it took college professor Robert James Waller just two weeks to pen "The Bridges of Madison County" in the early 1990s. The book went on to become a New York Times bestseller for three years, even outselling "Gone with the Wind." A 1995 a film adaptation starring Clint Eastwood and Meryl Streep (directed by Eastwood) pushed the story to even greater notoriety, and 2013 brought a musical version for the stage, which is being presented through May 20 at JCC CenterStage. "The Bridges of Madison County" is a romantic novel narrated to resemble non-fiction, but the story has no factual root. It's set in 1965 farmland Iowa and follows the four-day affair of Francesca Johnson, a 45-year-old Italian war bride who became a lonely housewife, and Robert Kincaid, a 51-year old National Geographic photographer who's documenting covered bridges in the area. When he stops at the Johnson residence to ask for directions, he meets Francesca, whose husband and two teenage children are away at the State Fair for a few days. Francesca and Robert kindle a whirlwind romance, and a choice must be made. Though the novel has a first person narrator (the author, a la "The Great Gatsby"), the musical's narrative is told through song. The show runs about two-and-a-half hours -- including a 15-minute intermission -- and features more than 15 musical numbers. In typical Jason Robert Brown fashion, the numbers range from the jazzy "Get Closer," performed marvelously by cast member Nancy Berg (Marge), to soaring ballads like "Wondering," which feels more like a poem: "But wouldn't it be fine to share/The weather in her eyes, her hair/Her footsteps as she climbs the stair/The shadow in her light?" There's even a little bit of gospel ("When I'm Gone") and honky-tonk ("State Road 21/The Real World") to lend a Midwestern twang. Artistic director Ralph Meranto has assembled a small but mighty cast for this show. Much of the singing falls to Robert (played by NYC-based Rochester native Mark Bradley Miller) and Francesca (played by local resident Kristin Mellema). While Mellema's Italian accent is at times hard to decipher, her singing is strong and clear, her intonations and characterization heartbreakingly authentic. Mellema is an ideal counterpoint for Miller's Robert, and the two have a convincing chemistry onstage, which is vital to the production's success. Miller is every bit the rugged wanderer, and while his vocals are less polished than Mellema's, it's a satisfying contrast. Rounding out the cast are seven local actors who take on supporting roles and stage crew responsibilities throughout the show. Standouts include the aforementioned Nancy Berg as Marge; Colin Pazik as Bud Johnson, Francesca's well-meaning but slightly vanilla husband (Pazik is clearly playing a character much older than he is, but does so with a little aging makeup and a lot of aplomb); and Avery Carlson as teenage daughter Carolyn Johnson. Carlson's voice is easily the sweetest in the show, and she commands the stage with her acting as well. Design elements are particularly strong, from Eric Williamson's angular, rustic scenic design to Diane Spacher's colorful costumes and Laura Fox's bouffant wigs. The pit orchestra, led by conductor Casey Filiaci, never once overpowers the singers, but maintains a complementary role throughout a musically demanding run. When Robert and Francesca are contemplating their affair, Roberts says, "I never go into a world where people belong to each other." That sentiment is an interesting juxtaposition to the name of the show, which Waller may have intended as a metaphor for the entire plot. Call it midlife crisis, loneliness, or romance -- but JCC CenterStage's production of "The Bridges of Madison County" will resonate with every audience member in some way.